When the officer working at the central station received the alarm, he would wait to hear it twice, then, using a telegraph key, transmits the box code twice to every alarm circuit in the city. He would then, over radio, contact the Police department and announces the box number twice. If the fire truck had to cross Market Street, he would sound the traffic warning bells . In the fire station, the officer in the telegraph office would receive the telegraphed signal. 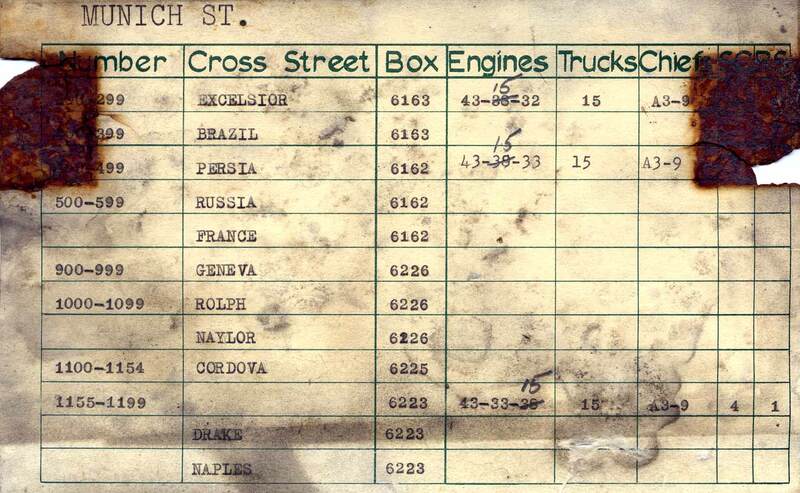 If he did not know what street the box number received was on, he would have to go through a large file cabinet that contained a card for each box in the city. Firefighters were not expected to know all the box numbers in the cities, but were expected to know to which boxes their fire station was the first or second response unit. In every station, there were the older firefighters that knew every box code in the city. For those firefighters that didn’t know every box location, the box cards, or running cards, were provided. 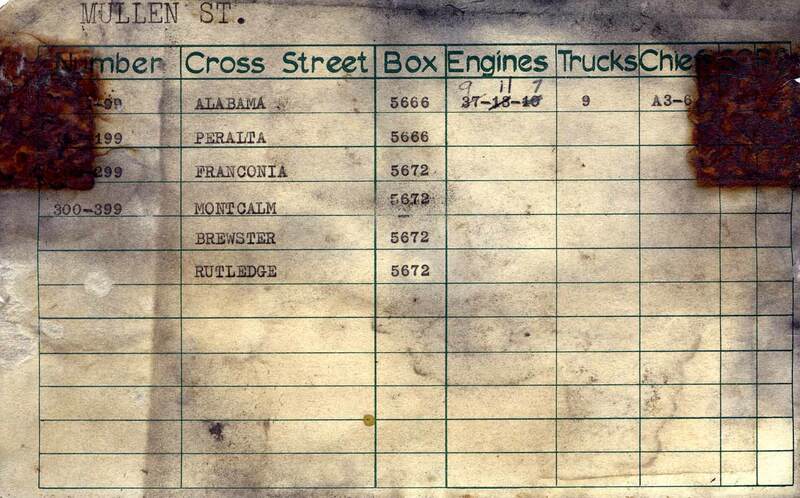 On these cards, there was the box number, its street address and cross streets, and which engines, trucks, and hook and ladder companies were to respond to the scene first, second, and so on. Every box had the capability of requiring up to five fire stations in the city, but generally the first two fire stations would respond to the scene. Once at the scene, if more fire trucks were needed, the fire chief at the scene would use a tapper in the box to call for backup. This signal would again be sent to the dispatch office, and the cycle would start again.